I’ve gone through several attempts before the final layout plan. Design process is mainly a succession of iterations, almost like resolving an integral calculus in mathematics. 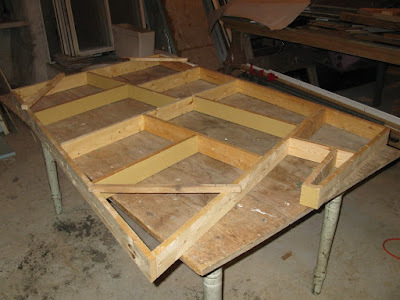 interesting way to experiment, it was going nowhere and was laying unused in my friend’s cramped garage. At the same time, I found out about Jack Trollope’s 149th Street Harlem Station layout on Carl Arendt’s Micro/Small Layouts #97 Scrapbook. 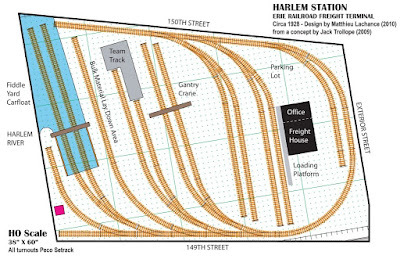 The following week, I made a quick mock up on the old 4 feet x 5 feet layout benchwork, which proportions were similar to the real Harlem terminal when scaled down to 1/87. However, using normal #4 turnouts was not a space effective solution. 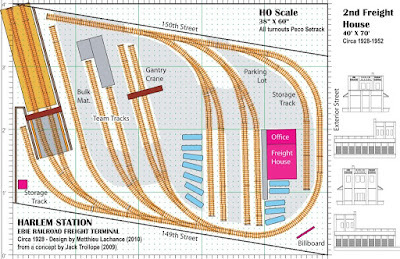 Clearly, PECO Setrack curved turnouts would have to be used to achieve a prototypical and enjoyable layout. Also, at that time, my understanding of this terminal was marginal and I was still confused about the 1928 freighthouse and its subsequent expansion in the 1950’s. In October of 2010, I followed Jack Trollope’s building process on RMweb. I was surprised that he could manage a lot of operation out of his heavily compressed interpretation. A short discussion with him encouraged me to try to build it with more realistic proportions. The first draft was on a parallelogram benchwork. Trackwork was looking awkward and I didn’t like the carfloat position. The second draft was better because I tried to reinterpret the real property polygonal nature. Things were starting to look like the prototype and the slight angle helped to get most of the sidings in place. I could also fit a full-size version of the 1928 freight house, an important condition to get a “sense of the place”. This version was shown on Micro/Small Layoutst's mid-November #103a Scrapbook. 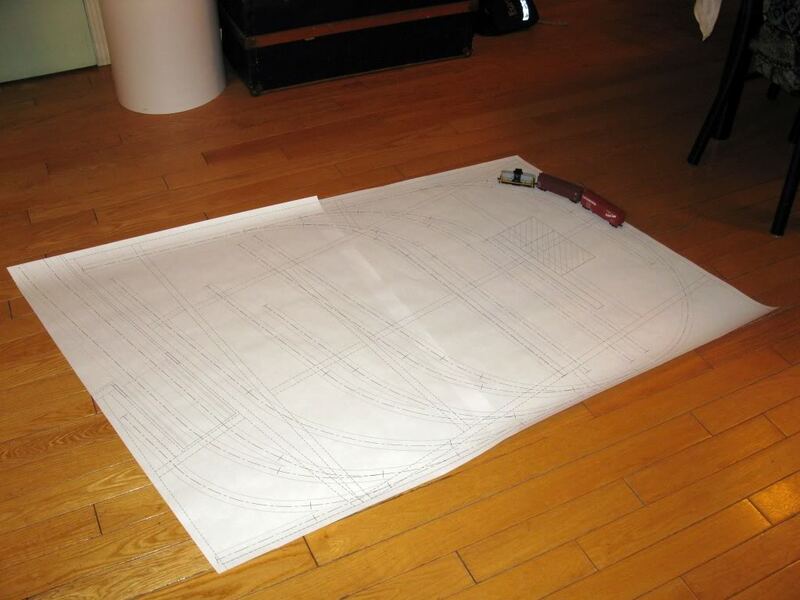 From this draft, I generated a CAD drawing that I plotted full-size on paper. 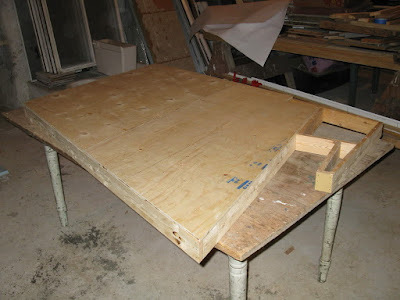 I dismantled the remains of the old benchwork, sawn the 2”x3” lumbers in halves and built the new benchwork accordingly. 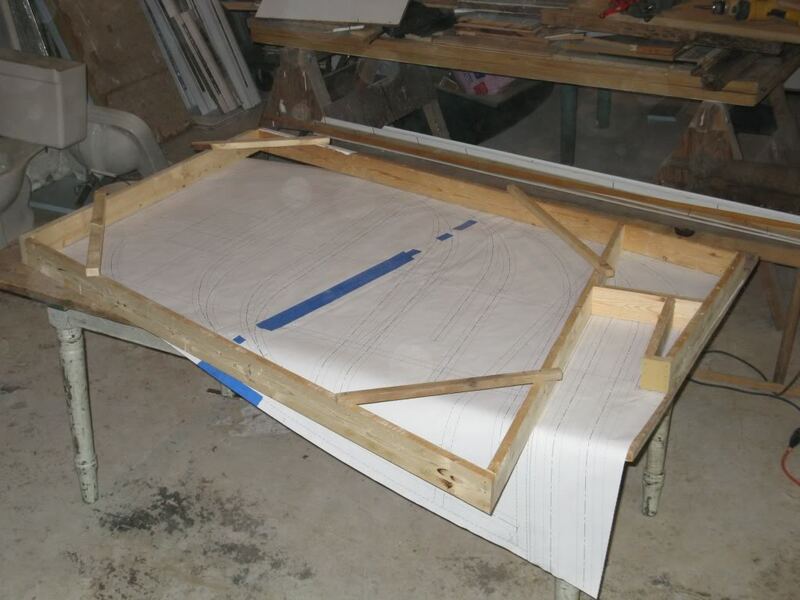 Working with a CAD drawing was a blessing, each lumber fitting exactly the odd angles. But quickly, I found out I was too quick to move from design to construction. I overlooked the fact that the protruding carfloat would be a real nuisance while operating the layout. I stopped the building process there and came back to design after a short discussion with other modellers on MRR’s forum. Looks like my compressed version raised pertinent questions. However, I still believe it is an excellent alternative to the prototype. Following this discussion, I decided to go full-size and incorporate the carfloat and tugboat into the layout. The previous compression was so little it was meaningless. I could afford to expand the layout a little bit. Also, I decided to design the layout in two parts as I already pointed out to Jack in a previous email. This will make it easier to move and install in the layout room. 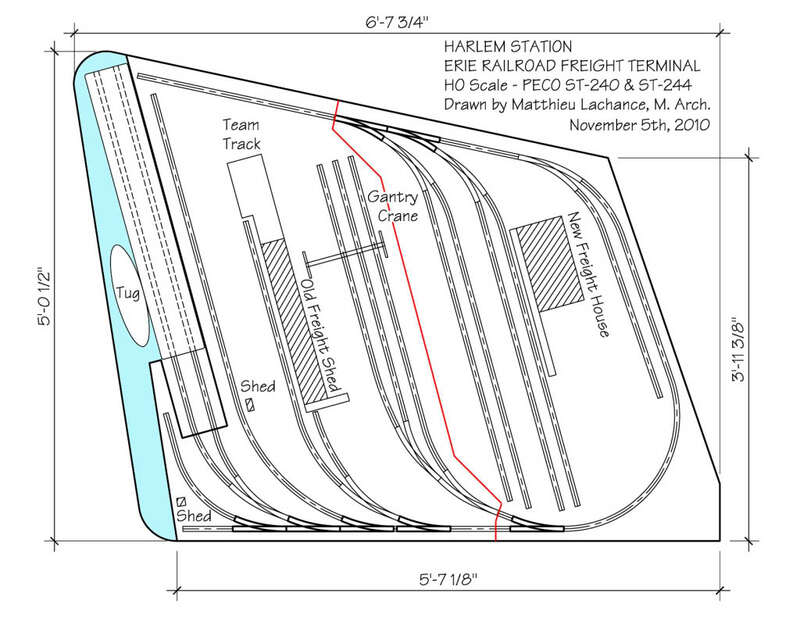 The benchwork is going to be largely inspired by Tim Warris’ CNJ Bronx Terminal. 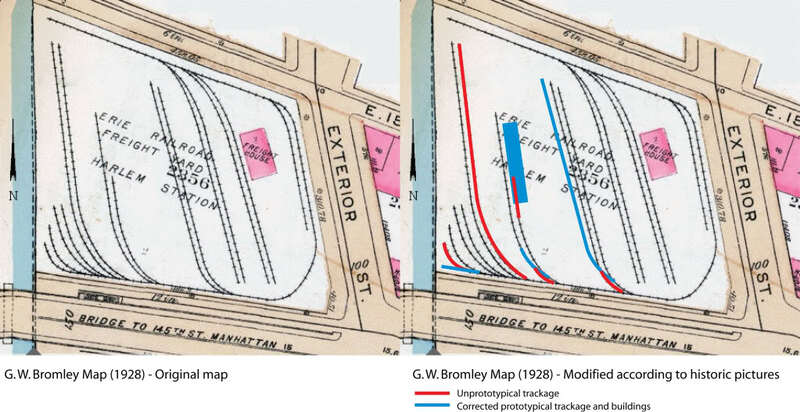 I imported the 1928 G. W. Bromley map in AutoCAD and I redrawn the entire layout full-size. 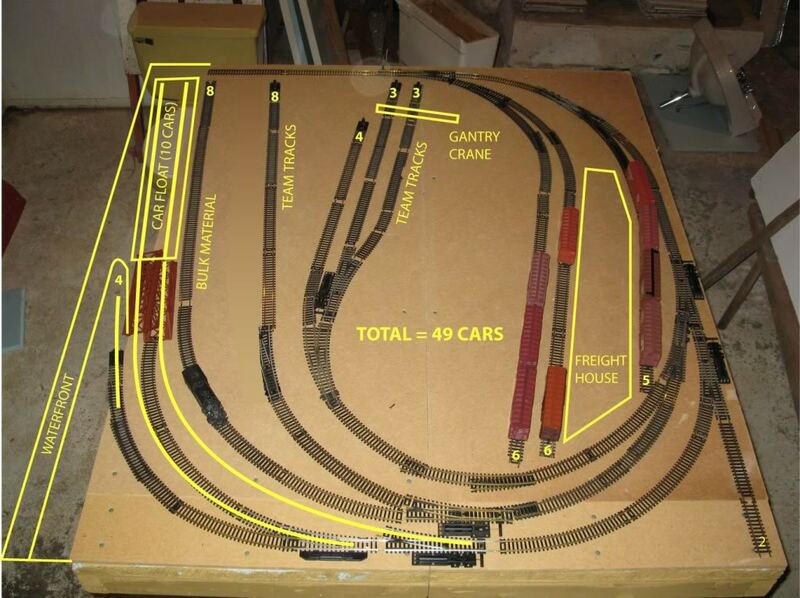 By chance, most of the trackage could be reproduced realistically with PECO Setrack components. The slight difference isn't worth, even for a rivet-counter. 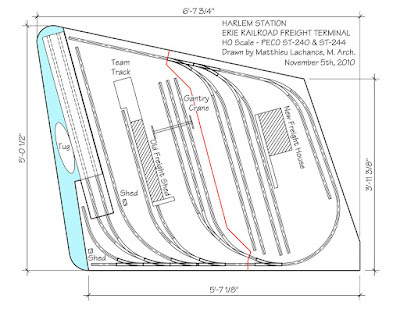 The smallest radius is around 14” (100 feet), which seems to be an average for all the Bronx rail-marine terminals (there was 87 feet radius curves in Harlem Transfer). And don't mind, most HO scale rolling stocks under 50' should run freely through these curves. 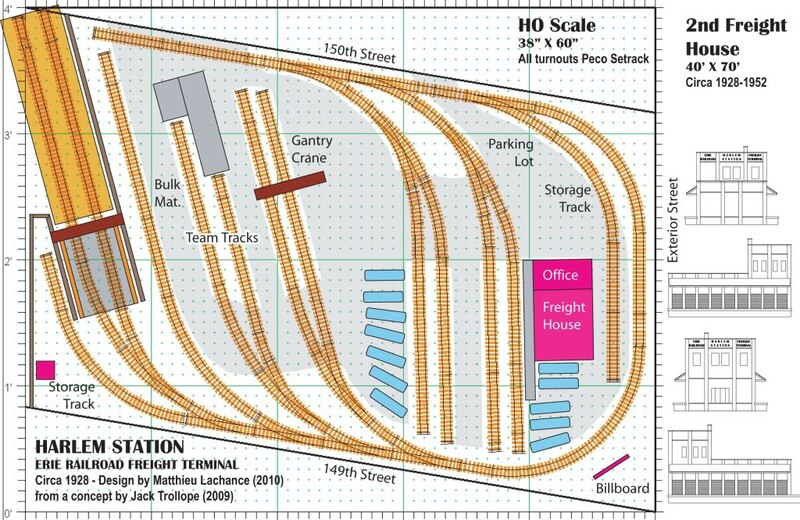 Here you can see the final layout plan. While drawing it, I found out many discrepancies between the map and historical pictures. For example, the left-most siding wasn’t curved but straight. The oldest pictures never show two sidings right to the carfloat, which is normal since the left one near the pier wouldn’t be accessible. 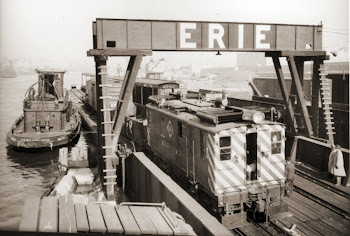 It seems 3 sidings were always under the gantry crane at all epoch, at least since the gantry crane was built (which date isn’t specified). The following map show you the discrepancies: in blue are the real trackage, in red are errors. 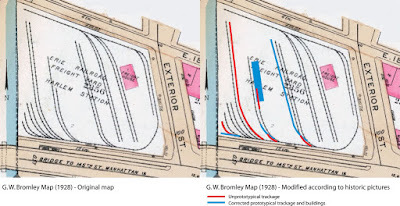 Habitually, fire insurances maps can be trusted for buildings, but they can be a little bit interpretative when reproducing railway trackage. With some reservations, I tried to reproduce the terminal as it looked circa 1928-1952. I also started to redraw the 1928 freight house. The main dimensions were taken from the G. W. Bromley map and comparative estimation from pictures. I used boxcar standard dimensions to estimate many components on the building. As a junior architect, I often have to interpret pictures into building plans, from iron-clad shed to rural Catholic church. The following drawing is only a draft and will still need interpretation and adjustment, mainly for the dark side of the freight house on 150th Street, which is never pictured on historical photographs. 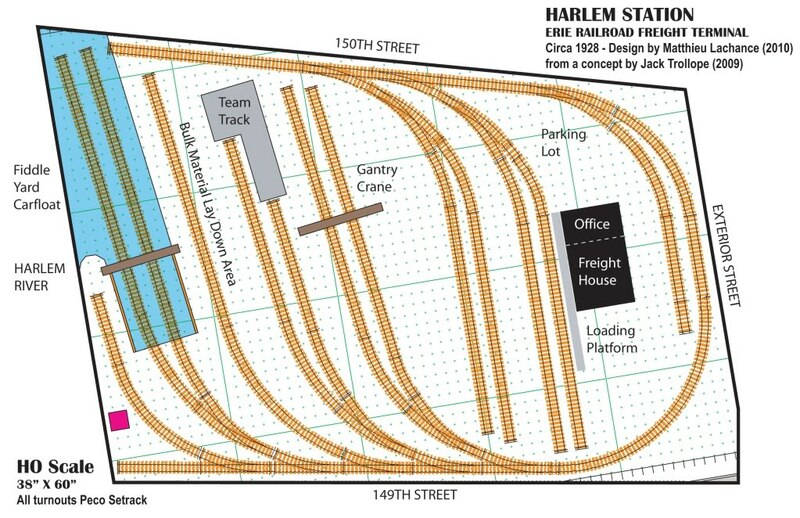 Very interesting interpretation of Harlem Station. Since I live in the NY metro area, I have photos of the gantry crane I can share if you wish. It still stands. I myself model the Erie's 28th Street Terminal. It's great to hear from someone linving in the area. I would appreciate to have a little bit more information on this gantry crane for modelling purpose. Feel free to contact me by email. 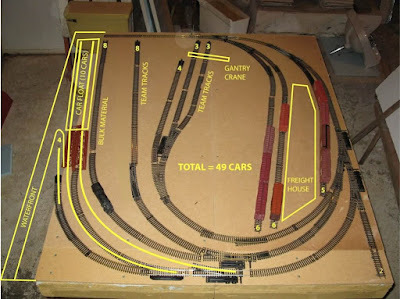 I haven't worked on the project recently since my basement is quite cold in the winter and I was focussed in upgrading the club layout (see Hedley-Junction.blogspot.com). However, I'll start to work on it again in the upcoming summer. I'm questionning myself about reusing a Walthers apron and float and stray a little bit from the prototype or follow my new plan. Thanks for your encouragement and good luck with your Erie Terminal. These "pocket-railroads" are real gem for the lone modeller! I can't seem to find your email address anywhere here. Please contact me at vincejlee_at_yahoo.com. 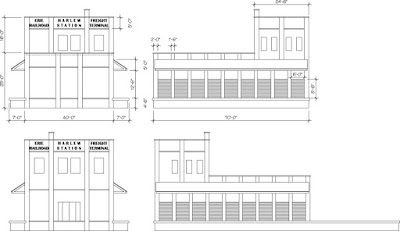 Replace the "at"
I model the Erie RR in N scale and in the past have started building the 28th st. terminal. I'd like to try building this terminal in N. I am wondering if you can share any drawings (I use autoCAD) I am interested in both the old and new freight houses because I will model them both.